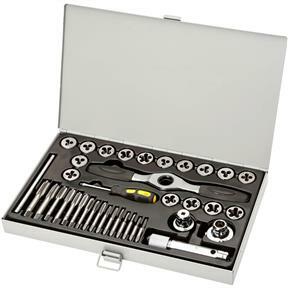 Ratcheting Tap and Die Set, Inch and Metric, 38-pc. Grizzly T10901 - Ratcheting Tap and Die Set, Inch and Metric, 38-pc. Like the T10900, this set features a ratcheting wrench that accepts both taps and dies with interchangeable adapters as well as a tap wrench with sliding handle. Sizes include 1" round #6–32, #8-32, #10–24, #12–24, 1/4"–20, 5/16"–18, 3/8"–16, 7/16"–14, 1/2"–13, M3, M4, M5, M6, M8, and M12 tungsten steel dies and taps. Screwdriver, hex wrench, and steel case included.